A Chilli Mandragora with a cluster of mushrooms. The mushrooms will be harvested when they have grown uniform in size. However, if there is not enough humidity during growth, the mushrooms' hyphae would extend to the root and thus the Mandragora's brain. 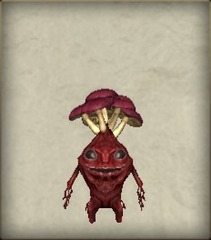 This might cause the Mandragora pain during harvest.